Hurricane Sandy rolled out of the Bahamas on Friday after causing 40 deaths across the Caribbean, churning toward the U.S. East Coast, where it threatens to join forces with winter weather fronts to create a devastating super storm. The Category 1 hurricane toppled light posts, flooded roads and tore off tree branches as it charged through Cat Island and Eleuthera in the scattered archipelago, with authorities reporting one man killed, the British CEO of an investment bank. The death toll was still rising in impoverished Haiti, reaching 26 on Friday as word of disasters reached officials and rain continued to fall. Joseph Edgard Celestin, a spokesman for Haiti's civil protection office, said some people died trying to cross storm-swollen rivers. While the storm's centre missed the country as it passed on Wednesday, Haiti's ramshackle housing and denuded hillsides make it especially vulnerable to flood damage. Officials at a morgue in the western town of Grand Goave said a mudslide crashed through a wooden home on Thursday, killing 40-year-old Jacqueline Tatille and her four children, ranging in ages from five to 17. Oct. 22: Tropical Depression 18 forms over southwestern Caribbean, about 515 km south-southwest of Kingston, Jamaica. Six hours later, the U.S. National Hurricane Center says it has grown to tropical storm force and names it Sandy. Oct. 23: Jamaica and Cuba begin making preparations for the strengthening storm. Oct. 24: Sandy becomes a hurricane with winds of 130 km/h just before slamming into Jamaica west of the capital, Kingston, at about 3 p.m. EDT. The storm crosses the island within five hours, killing one, blowing off roofs and cutting power to half the country. Forecasters begin warning that Sandy could combine with two other weather fronts in the U.S. to create a "super storm." Oct. 25: Sandy grows into a Category 2 hurricane with winds of 185 km/h and blasts across Cuba in less than seven hours without losing force. 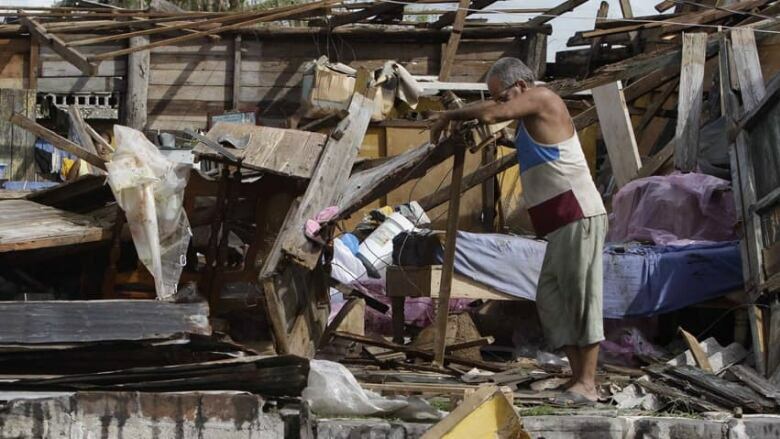 Officials say 11 people are killed, 5,000 houses are at least partially collapsed and 30,000 lose their roofs. Crops are badly damaged. But the greatest damage is in nearby Haiti, hit by the storm's outer bands. Officials say at least 26 people die over two days, most in flooded rivers or collapsed houses. U.S. authorities at Guantanamo Bay naval base are forced to halt a hearing for a suspect in the 2000 bombing of the USS Cole. By early afternoon, Sandy rolls into the Bahamas and begins to weaken as winds fall to 150 km/h. Oct. 26: Sandy emerges from Bahamas after killing at least one person and causing widespread power outages. It weakens to winds of 120 km/h. A Puerto Rico man dies in a river swollen by the storm's rains. 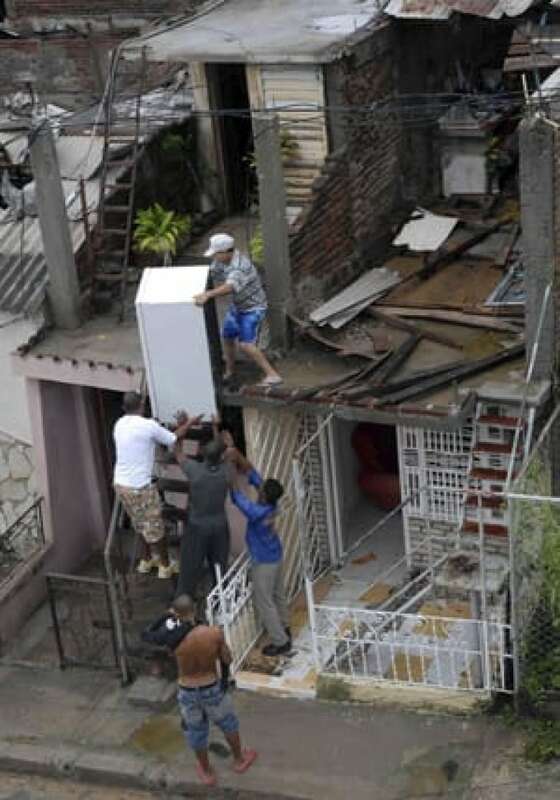 Cuban authorities said the island's 11 dead included a four-month-old boy who was crushed when his home collapsed and an 84-year-old man in Santiago province. Near the city of Guantanamo, the Communist Party daily Granma reported, two men were killed by falling trees. Sandy also killed a man in Jamaica on Wednesday when a boulder crashed through his house, and police in the Bahamas said a 66-year-old man died after falling from his roof in upscale Lyford Cay late Thursday while trying to repair a window shutter. Officials at Deltec Bank & Trust identified him as Timothy Fraser-Smith, who became CEO in June 2000. One death was reported in Puerto Rico. Police said a man in his 50s was swept away Friday by a swollen river in the southern town of Juana Diaz, where rain from Sandy's outer bands has been steadily falling. On Friday afternoon, the hurricane's centre was about 50 kilometres north-northeast of Great Abaco Island in the Bahamas and 695 kilometres south-southeast of Charleston, S.C. Sandy was moving north at 11 km/h with maximum sustained winds near 120 km/h. "I hope that's it for the year," said Veronica Marshall, a 73-year-old hotel owner in Great Exuma. "I thought we would be going into the night, but around three o'clock it all died down. I was very happy about that." On Long Island, farmers lost most of their crops and several roofs were torn off, said legislator Loretta Butler-Turner. The island is without power and many residents do not have access to fresh water, she said. With the storm projected to hit the Atlantic coast early Tuesday, the U.S. National Oceanic and Atmospheric Administration warned it could merge with two other systems to become a hybrid, monster storm. In the Bahamas, power was out on Acklins Island and most roads there were flooded, while on Ragged Island in the southern Bahamas, the lone school was flooded. Jennifer Savoie, a New Orleans native who lives in Eleuthera, said that her fiance's resort, The Cove Eleuthera, was spared major damage but that power is out across most of the island. "We know the protocol and how to prepare," she said. "It's in our blood. We were hit pretty hard though." There were no reports of injuries at the U.S. naval base at Guantanamo Bay in Cuba, but there were downed trees and power lines, said Kelly Wirfel, a base spokeswoman. Officials cancelled a military tribunal session scheduled for Thursday for the prisoner charged in the 2000 attack on the Navy destroyer USS Cole. Officials reported flooding across Haiti, where many of the 370,000 people still displaced by the devastating 2010 earthquake scrambled for shelter. There are nearly 17,800 people in 131 temporary shelters, according to the Civil Protection Office. The U.S. military will be moving ships from the Norfolk Naval Station region in Virginia out to sea to get out of the path of Hurricane Sandy. The navy says 24 of the larger ships in southeastern Virginia bases, including the aircraft carrier USS Harry S. Truman, are preparing to leave and will be moving out over the next day or so. 'Frankenstorm' may be headed for Eastern Canada, U.S.